It doesn’t happen very often and you don’t need any special equipment or experience to see it. For the first time in more than 10 years, it will be possible to see all five bright planets together in the sky. Around an hour or so before sunrise, Mercury, Venus, Mars, Jupiter and Saturn, the five planets that have been observed since ancient times, will appear in a line that stretches from high in the north to low in the east. The planets are visible from right across Australia in the dawn sky. You can start to look for the lineup from Wednesday, January 20 and it can be seen right through until the end of February. 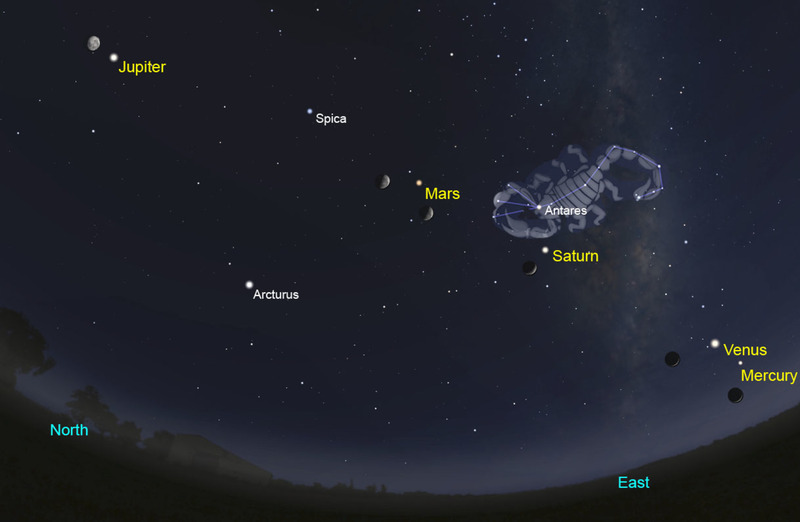 Venus, Mars, Jupiter and Saturn have been in the morning sky since the beginning of the year. Jupiter is bright in the north, next comes reddish Mars, followed by pale Saturn and lastly brilliant Venus, which shines above the eastern horizon. It is the appearance of Mercury that makes the family complete. Go grab your scope or binoculars and check ’em all out in one fell swoop. Mercury has just transitioned from an evening object to a morning object. At first it will appear quite low to the eastern horizon and of all the planets it is also the faintest, so it will be hard to see to begin with. However, Mercury will continue to rise higher each morning and by early February it will sit just below bright Venus. If you need something a little more to get you leaping out of bed before sunrise, then here are the dates to mark in your calendar. From the end of January, the moon will travel by each planet and can be used as an easy guide for your planet-spotting. On January 28, the moon will be right next to Jupiter. Come February 1, the moon (in its Last Quarter phase) will be alongside Mars, then on the following morning it’ll sit just below the red planet. On the morning of February 4, the crescent moon will be near Saturn. Then on February 6, the moon will be alongside Venus and on February 7, a thin sliver of moon will sit below Mercury. The line formed by the planets in the sky closely follows the ecliptic, the apparent path of the sun against the background stars. This path marks the plane of our solar system, visual proof that the planets, including Earth, all orbit the sun on roughly the same plane. The ecliptic is bordered by the constellations of the zodiac and one of the most recognisable zodiac constellations is Scorpius. If you’re awake before the first rays of the sun begin to drown out the stars, then look for the curved outline of the scorpion between Mars and Saturn. In fact, sitting just above Saturn is the red supergiant star Antares, which marks the heart of the scorpion and its reddish colour makes it the perfect rival for Mars. It’s been a long time since the orbits of all five planets have brought them together to the same patch of sky. To make the best of the viewing opportunity try and get to a clear open space where you can see from the north all the way across to the eastern horizon. As early February comes around, I also highly recommend checking out the flight path of the International Space Station via websites such as Heavens Above or NASA’s Spot the Station. The Station will be flying morning passes over Australia during that time and current predictions for each capital city have it travelling right through or near the line of planets, for example: Darwin (February 3), Brisbane (February 5), Perth (February 6), Sydney (February 7), Canberra (February 7), Adelaide (February 8), Melbourne (February 9) and Hobart (February 11). Good luck Carol, hope you get some great shots. I’m not a scientist or a physicist but I love this stuff and am already for the planets to appear,I’m at port hughs at the moment and have a great opportunity to see without the interference of city lights,just waiting and hoping for clear skies.I have my tripod and camera ready to go.